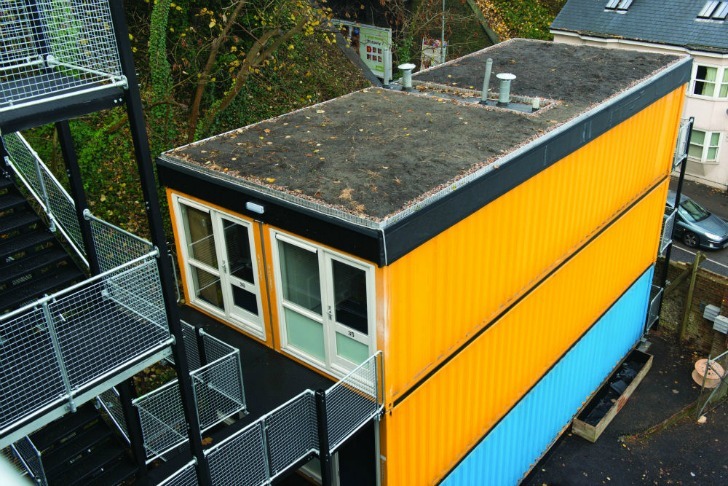 Building with shipping containers may be a sustainable way of creating solid structures from a fairly ubiquitous repurposed material, but now it's also forging its place in social design as well. Last year, the Brighton Housing Trust built 36 homes out of converted shipping containers in order to house some of the area's local homeless population. The compassionate project organized by the housing trust and QED Property stemmed from the desire to help those in need locally and to establish a pattern of social design with the low cost, durable material. The modular shipping container block structures were designed by QED Property in collaboration with WCEC Architecture and are located in a former scrap metal yard, referred to as Richardson’s Yard. Set on two lots, the buildings have a five year agreement to stay on the site. Although the project has been commended by most for its success over the last year since the residents moved in, a few drawbacks to building with shipping containers have come to light. As is common, proper insulation is fairly problematic and some of the residents of the Richardson’s Yard community expressed concerns about the high cost of heating their units during the wintertime. The project continues to grow as nine more containers are currently being installed as office space and community facilities. How can I help get a project like this up and running in the San Francisco bay area? WoW! Hat's off to all the people that got this project up and running. What a great idea. So good to see innovative people coming up with these ideas for what is such a huge problem- housing affordability and homelessness. Is the cost cheaper? If so, Bravo! A year after construction, the pioneering development is considered an overall succcess. The modular shipping container block structures were designed by QED Property in collaboration with WCEC Architecture and are located in a former scrap metal yard, referred to as Richardson's Yard. Set on two lots, the buildings have a five year agreement to stay on the site. As is common, proper insulation is fairly problematic and some of the residents of the Richardson's Yard community expressed concerns about the high cost of heating their units during the wintertime. Although the project has been commended by most for its success over the last year since the residents moved in, a few commom drawbacks to building with shipping containers have come to light. The container homes will offer decent shelter for the local homeless population.